Parenting for a Digital Future – Welcome to our blog! How do parents seek to bring up their children in the digital age? What is parents’ vision of their children’s future and that of the wider society? What risks and opportunities will characterise the digital future? This blog explores the task of parenting for a digital future – both here in the UK and internationally. It is part of a research project (see ‘About our research’) examining the host of linked questions currently absorbing parents and the wider public, as they reflect on and manage their daily lives, as well as policy-makers trying to shape the digital future and social scientists keen to track key trends. We need a dialogue and exchange between the public and social science worlds. The public – especially, but not only, parents – face many challenges in relation to children’s changing digital lives. Some of these are in the here-and-now (e.g. 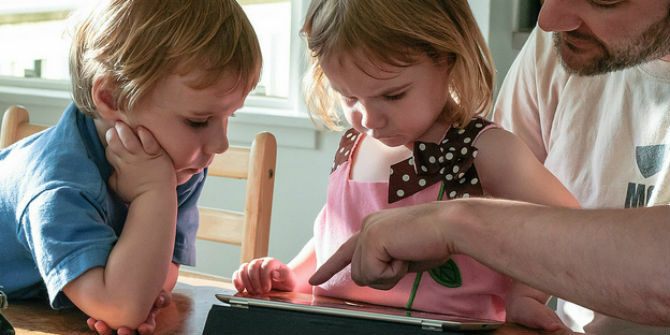 should children have their own tablet computer? Are they really learning anything from playing computer games?). Some are more future-oriented (will coding help them get a good job? Are we losing our privacy in an age of digital surveillance?). We reflect on such topical questions by discussing what’s ‘On our minds’. At present, we are conducting interviews and observations with a wide range of parents and children. Some have ‘voted with their feet’, joining digital media or coding clubs. Some prefer to keep digital media for their personal leisure time. Some have special needs and hope that technology will help them connect better with the wider world. Some are just worried about the influx of fast-changing digital tools and don’t know what to think. We’ll keep you up to date with our fieldwork by bringing you reflections in ‘From our notes’. Since we have access to a wealth of academic research in the libraries as well as the latest reports, we will also blog some background information. We hope it’s useful if we synthesise the key insights or latest findings on parenting and digital media in our changing society. We’ll do that under ‘From our notes’ too. But since we’re sitting in London, and things are changing everywhere in different ways, we invite researchers and commentators from ‘Around the world’ to add their own experiences, observations and expertise. It’s often hard to see how our lives could be other than what they are. We really hope that collating accounts of diverse ways of living with ‘the digital’ will provoke you to think afresh about what we currently take for granted. Those with a personal responsibility: parents and carers, grandparents or other relatives and mentors. Those with a direct professional responsibility: teachers, informal educators, childcare professionals, clinicians, social workers, etc. Those who advise or have responsibility for supporting parents, whether formally or informally: journalists, parenting experts and advisers, parent bloggers, media regulators, policy-makers. We will post one or more blogs each week, from our team and from guest bloggers. We’d love to hear from you in return. Contact us (A.Blum-Ross@lse.ac.uk) to tell us what you think, to offer great links or suggested topics, etc. If you are interested in contributing to our blog, our editorial guidelines are here. This is a very interesting topic and highly relevant to what is going on today with digital technology taking over nearly every aspect of our lives it is important to know just what are the implications of using digital technology daily.